at first, i was looking for making benjolin into open source with cad and gerber file, but after talking to rob he's against to do so, in order to prevent somebody may start a small business from it which is the key problem i was thinking: what could i do to contribute to the diy community? and how. i hope i could bring something fun and interesting. after discussion with rob i'm going to have a run of pcbs here in forum under his approval. but there's something you need to be aware of: i won't made a run of panel so you have to do this on your own by creativity(there's a layout file of panel in the bottom for your information) and people would be limited to buy two of pcbs in maximum. this is a one time group buy, if rob agree with me to do this again once this is gone, its gone. 2.when you turn done the pot's the cv might flow into gorund, see page19. 3.if you use a non-symmetrical power transformer, there's some chance when the voltage came up before the other one that caused regulator(78l09&79l09) detect the voltage as inverted which will force the other regulator turn into permanent short circuit protection mode, resulted in quad vca(2164) can't work functionally so there's silence output. see page13. 2. the maximum participants number should be mention on the workshop advertisement. this project won't have to be a eurorack module, if you can modify them into a standalone portable synth, 5u, buchla... that would be very interesting. benjolin need +9~-9v in the internal circuits to supply op-amp(tl072, tl074), vca(ssm2164), stage-shifter(cd4021) so there's an 78l09, 79l09 as regulator to transform input voltage into -9v, +9v. just check the input voltage limit of 78l09, 79l09 which would match the psu you want to use or not. 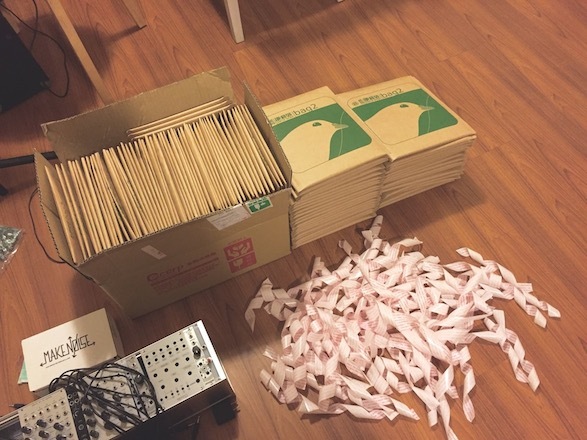 at the end, the price of pcb would be 25$ each with shipping & tracking to ww. if you are still student with stident's id card, the price would be 20$(ms, ba even hs! apologies to ph.d). please fill the blank in the google form, i would accept the payment by paypal. if there's any question feel free to pm me or reply this post, thanks! ps. the license of the ai file which is disapproved formally by rob if someone wants to make a commercial run of eurorack frontpanels for this pcb. most of the makerspace & fablab provide the laser cutter or cnc machine for free or a minimum usage fee, you might check them out. SWEET! Definitely in for two. Hold on a second. Do you or don't you actually have Rob's approval to sell these? 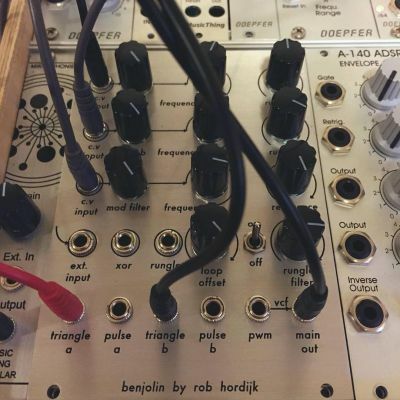 From what I understand from previous discussions he specifically does not allow euro versions of Benjolin pcbs to be sold or distributed as it is already licensed to to Epoch Modular. As another wiggler talked to him very recently about this exact thing I highly doubt Rob has suddenly changed his mind. Please, no one else respond to this person until this is straightened out. I'm the other wiggler in question. 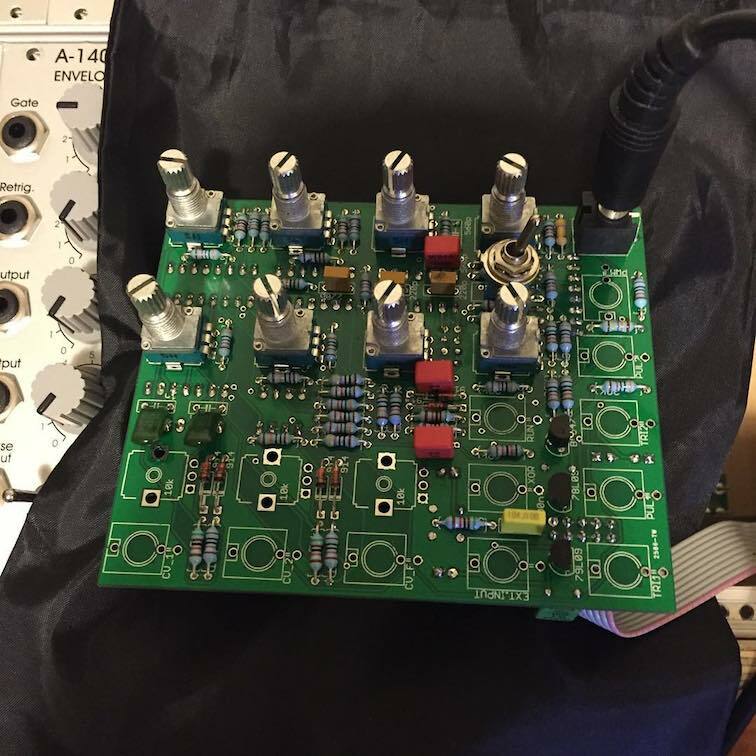 I'm skeptical that Rob has approved any Eurorack version of the Benjolin PCB other than the Epoch Modular version. The Benjolin is specifically designed for the DIY community. The idea was to design a relatively simple instrument that does have enough sonic potential to be attractive for people to come to a workshop where they can build one as a first time project and learn a lot of things about DIY during the workshop. So, it was not only about the Benjolin itself but also on how to go about doing a DIY project and bring it to a good end. But as I have no time anymore to organise workshops, or put together kits, I do not mind if others take over. But I specifically would like it to be in the original spirit. I had lots of questions from people wanting to use the >design for a commercial version, and I finally decided to licence it to Epoch Modular for a commercial Eurorack version and to Macumbista for a commercial banana version. As long as both of them continue production there can be no other licences for commercial versions. Understood. If the effort I'm working on ends up including a Euro panel pcb + panel, as individual things, not assembled or part of a kit, would that be pushing it too close to Epoch's work? Perhaps I should ask them that question? Regarding a Euro frontpanel I would object. I'm interested to hear words from Rob corroborating the claim that this project has his approval. Edit: further thinking about this leads me to the thought that perhaps the issue is the panel itself; that wasn't my interpretation of what Rob said, but in retrospect that does seem a reasonable alternate interpretation. I've contacted Rob directly to ask for clarification. I'll post anything he has to say here either way. I finally decided to licence it to Epoch Modular for a commercial Eurorack version and to Macumbista for a commercial banana version. As long as both of them continue production there can be no other licences for commercial versions. Taking both those statements together I would suggest he means no other designs to be made for sale at all without a specific licence agreement with him. He's actually being open and transparent with this, so before you get your collective torches and pitch forks ready, as you all like to do, you should hear him out. The one thing that I want to prevent is that if a PCB becomes available someone buys a lot of these PCBs and starts selling unlicenced Benjolins. So, I do not mind, in fact I would like it if a PCB can be bought from a reliable source, but with the restriction that one can buy only a maximum of two PCBs. So, to make sure that the original spirit of DIY is preserved and it is not hijacked by someone who just wants to make money by selling an unlicenced version based on this PCB. So, if a group of people would organise a run of PCBs through e.g. a crowdfunding construction it would be a good thing. I don't think it is a good thing to make e.g. Gerber files available, as in that case it would be easy for someone to sneakily have a series made with the files. I think that the person who designs this PCB (meaning you) would agree with me. So, if you have a PCB design that works then I think the next step is to organise a crowdfunding thingy where everyone that wants one or two PCBs would chip in and then a series of PCBs is made. I would like if this is supported by Muffwiggler and so I think it would be good to do this in close contact with Mike who runs Muffwiggler (I think he is Muff on the forum). If needed I could supply the V2164 as I have a lot of stock of this chip. The price being something like two USD for a V2164. It would also be possible to do this through the electro-music.com store, as Howard Moscovitz who runs it is a good friend of mine. If some group of people would like to organise a workshop where people would come to build their own Benjolin, and advertise the workshop on Muffwiggler or electro-music.com, then a buy for more than two PCBs as necessary for the workshop should of course be no problem. Regrettably I do not have the time to assist in the actual organization of such a project, so I leave it to those who would like to bring this to a good end. And as long as it remains in the spirit of DIY I have no objections. I have also pointed him directly to pictures of my prototype on the Benjolin thread I've participated in and gotten acknowledgement from him that this is ok.
My intentions are not commercial. I have spent a lot of time trying to make sure I do this project right (it's basically my inaugural effort at this sort of thing), including multiple revisions, prototypes, etc. I do not question kweiwen's intentions here from that perspective. He also has repeated those same points that Rob has made regarding two per person, so he does seem likely to have had some conversation with Rob about this. My initial reaction was that I had a differing interpretation of Rob's statements about Euro, but as I say, on further reflection I do think it is possible that my interpretation is the wrong one and I will defer to Rob for a final say, hoping he has time to answer sooner than later. I agree, and I am happy to do so. Hopefully my edits and additional statements have made this clear. I do see the selling rules being a problem for a brand new wiggler, but I leave that to the mods to address. interested in 1, a panel option would be great also. feel free to add me to a waiting list / PM me if you get to the point of selling the PCB's. all i know about the benjolin is that it looks like fun. so i hope this happens. He can be trusted even though he has only 3 posts. I have talked to Kweiwen about this before he did this and the reason he is offering it here despite his low post number is because that was Rob's wish (as opposed to make it completely open source). I'm in for one, I signed up in the form. Of course only if Rob is ok with it. Don't worry, I haven't shut this down quite yet. He may well be fine with Rob, I just want to make sure - it's entirely unclear from his one post here so far. Although the 3 post wiggler thing is a problem that isn't going to go away. All references to sales of this here need to be removed. He's free to sell these elsewhere, just not here directly. Definitely interested, but yeah, only if its ok with the designer. but this is more akin to a group buy, not a sale. As i understand the terms are: a limited run, for personal use only, not more than two boards each ... not something that will be available for sale on a regular basis (as some of these 'mutable' pcbs), and not something where ready-built modules will show up soon (like with the Random Source euro pcbs). Do group buys also fall under the 100 post limit? Anyway, if it goes ahead, i'd be also interest. Ah, yes. I can vouch for him if needed. I am familiar with him from other SDIY groups. Really we should be happy to have him on Muffs! As far as "sale" goes, he means this as a group buy, which was Robs request of how he should proceed from what I understood. Can also vouch for after a previous group buy on another SDIY group. is a good dude. very knowledgeable / helpful!